Coil straighteners | COLIMATE® | Pressroom Feeding Equipment | Coli Handling Equipment | Innovative Oil Storage Systems products | The Bernard Company, Milford CT. The CoilMate®/Dickerman® line of high performance coil straighteners are engineered to maximize your productivity with more standard features that would be considered optional on competitive coil straightener equipment. All coil straightener units are designed in the USA to remove coil set and provide smooth payout of coiled material that translates into improved feeding efficency and accuracy. CoilMate®/Dickerman® stands behind its coil straightening equipment and systems with an industry-leading, Two-Year Warranty. CoilMate®/Dickerman® Coil Straighteners can accomodate material widths from 6" (152.400mm) to 30" (762.000mm). Larger coil straightner widths and gauges as well as heavy duty and HSLA configurations can be provided. The 12EFT coil straightener builds on the features of the 6" model with increased width and versatility. The Economy Flip-Top (EFT) Model(s) Coil Straighteners feature: Flip-Top Design, Entry and Exit powered pinch rolls, individual roll adjustment, 75 FPM with loop arm control, remote jog pendant, 110V Single Phase. Series B Coil Straighteners feature: Single Bank Adjustment. Standard 7 rolls. Optional 9,11 or more rolls. B Series Coil Straightening Machines are designed to remove curvature (coil set) and minimal crossbow from coiled stock. The coil straightener has seven (7) straightening rolls with a pair each of entry and exit pinch rolls. The four lower straightening rolls, entry and exit pinch rolls are all power driven. All coil straightener rolls are hardened, ground and mounted in anti-friction bearings. All B Series Coil Straighteners feature simple two-point adjustment of head for quick set-up of different material thicknesses. Calibrated roller housings enable precise positioning of Coil straightener roll depth settings. A series of catenary rolls is mounted at the exit end of the coil straightener to assist the material into the slack loop. CoilMate®/Dickerman's rugged steel weldment cabinet/frame combination provides a sturdy machine foundation for the combination Stock Reel and Power Straightener. Fabricated expansion arms are self-centering. The combination stock reel and straightener three-arm mandrel design provides durable support and superior loading access for coil hooks, slings or tynes. A link type expansion mechanism affords ample range and leverage for adjustment ease. Manual expansion is accomplished from the front of the combination stock reel and straightener by a convenient, fold away crank handle. A disc type air drag brake is adjustable by pneumatic regulator to control over run. The Econo-Pak Combination Stock Reel and Straightener integrated coil feeding system provides profitable feeding technology priced for today's high production stampers. The system integrates a job-proven 12" ServoMatic IV servo feed with a rugged Model 12CRS Combination Stock Reel and Straightener in a compact, price driven package. The combination stock reel and straightener offers quick changeover, threadup and easy operation with operator-oriented keypad programming. The combination stock reel and straightener has generous 12" wide x .078" thick x 3,000 lbs.capacities. The Model 12CRS Combination Stock (Coil) Reel and Straightener. Options for Combination Stock Reel and Straightener include: Modulating Drive with ultrasonic loop control or N/C Control. The Econo-Pak Combination Stock Reel and Straightener integrated coil feeding system provides profitable feeding technology priced for today's high production stampers. The system integrates a job-proven 12" Combination Stock Reel and Straightener ServoMatic IV® servo feed with a rugged Model 12CRS Combination Stock Reel and Straightener in a compact, price driven package. The combination stock reel and straightener offers quick changeover, threadup and easy operation with operator-oriented keypad programming. The combination stock reel and straightener has generous 12" wide x .078" thick x 3,000 lbs. capacities. Coil Stock Reels from CoilMate® / Dickerman® Rugged 2R through 4R coil stock reels are available from CoilMate® / Dickerman® as plain or motorized, single or double spindles. CoilMate is able to provide you with coil stock reels of uncompromising quality. The 2R Coil Stock Reel is specifically designed for light and medium gauge coiled stock material. The 2R coil stock reel as with all CoilMate® / Dickerman® coil stock reels can be configured to work in a "Pull-Off" application with the power being provided by related equipment or they can be provided as "Pay-Off" reels when equipped with a drive system. For more information regarding various stock reel configurations, please contact The Bernard Company. . The 2.5R Coil Stock Reel features a higher weight capacity as well as a larger max coil O.D. Please call one of our knowledgeable sales application engineers today and hear how the 2.5R coil stock reel can help your company improve it's profits. The 3R-18 Coil Stock Reel sports a 4,000 lb. (1,818.181 kg.) capacity with a width of 18" (457.200mm) and up to a 60" (1524.000mm) coil O. D.
The 4R-18 Coil Stock Reel features the largest weight capacity in the CoilMate® / Dickerman® Coil Stock Reel line-up, able to handle up to 8,000 lbs. (3,636.363 kg.) reels with an 18" (457.200mm) width and up to a 60" (1524.000mm) reel O. D.
The main attributes of the 4R-24 Coil Stock Reel are support for coil widths up to 24" (606.900mm) with a weight capacity of 6,500 lbs. (2,954.545 kg.) Speak with one of our sales application engineers today to see if the 4R-24 coil stock reel is the right piece of equipment to improve your productivity. The 4R-30 Coil Stock Reel provides maximum versatility for job shops and other stampers that run a wide range of applications. This coil stock reel is ideally suited for wider and thicker material applications. CoilMate® Scrap Choppers cut your scrap collection problems down to size and allow you to easily store your skeleton strip for collection. Three high-performance scrap chopper models are available to minimize scrap handling and save floor space. These scrap chopper models are available for versatility from job to job and punch press to punch press. The Model SC—1 Scrap Choppers are a cost effective method to minimize the skeleton strip from a punch press and turn that scrap into a premium-priced recyclable material. The Model SC—2 Scrap Chopper, All CoilMate®/Dickerman® scrap choppers are self contained, including the power source and as such do not consume energy from the punch press to operate. Therefore, your press experiences less stress and wear and tear and is NOT subjected to off-center loads. The Model SC—3 Scrap Choppers feature a wider throat capacity, while maintaining the ability to cut 6" wide scrap at .125 thickness. Pallet decoiling, a technology pioneered by CoilMate® , has rapidly become standard equipment for the metal stamping and rollforming industries worldwide. CoilMate's patented line of pallet decoilers typically cut coil-changing downtime up to 90 percent or more. In many operations, this increases overall production by one-third or better. Because CoilMate® is both designer and manufacturer of pallet decoilers, they can meet your special size, gauge and production requirements. They can alter platform size, dancer arm assemblies, speed controls and add various non-contact loop controls to meet your most demanding applications. Open up a new world of production possibilities with CoilMate® / Dickerman® pallet decoiler products for more profitable coil and material processing. The Model EZ5048 pallet decoilers are rated for 5000 lb. capacity and can handle up to 48” diameter coils. The EZ pallet decoiler model uses a DC regenerative drive control coupled with a dancer arm and analog proximity switch to smoothly match the line speed. This pallet decoiler system decelerates at the same rate that it accelerates, regardless of if the pallet decoiler is full or almost empty. 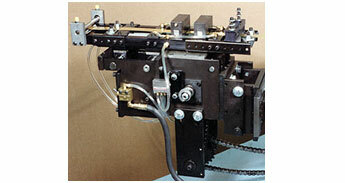 The Model HS pallet decoiler is specifically designed for high-speed rollforming applications. The HS pallet decoiler is equipped with a heavy duty failsafe braking system to help eliminate over coasting. CoilMate®'s pallet decoiler unique drive system consistently controls the acceleration and braking of the platform. Pallet Decoiler Capacity: 4,000 — 12,000 lbs. Pallet Decoiler Platform Size: 42" Sq. or 48" Sq. and 60" or 72" Dia. Pallet Decoiler Max. Coil O.D. : Up to 72"
Pallet Decoiler Coil Stack Height: Up to 37"
The Model CM Pallet Decoiler provides maximum versatility for job shops and other stampers that run a wide range of applications. The pallet decoiler patented hold-up arm helps reduce the load on the press feed while reducing material "bounce" making the CM pallet decoiler the ideal choice for intricate high speed stamping. Pallet Decoiler Capacity: 4,000 — 8,000 lbs. Pallet Decoiler Max. Coil O.D. : Up to 72 "
The Model EZ Pallet Decoiler is designed for fast and easy set-ups with no adjustments, weights, pulleys, cables or springs required to operate. The pallet decoiler patented shock absorbing feature eliminates material bounce common with decoiling methods. Direct chain driven center spindle design virtually eliminates the problems associated with caster wheel rim driven pallet decoiler units. Now you can get CoilMate®/Dickerman® Servo Roll Feeds loaded with standard features that would be optional on competitive servo roll feed models. All CoilMate®/Dickerman® servo roll feeds deliver fast set-up and outstanding accuracy across a wide variety of materials and applications. All servo roll feeds are backed by an industry leading 2-year warranty and are available for quick shipment. The ServoMax® SE Servo Roll Feed provides dependable performance for demanding coil processing applications. Complete with features listed above as well as, Matte Chrome Traction Rolls, Pneumatic Pilot Release, Cluster Gear Upper Roll Drive and provisions for a Mechanical Stroke Limiter. The ServoMatic® IV 6" and 12" Servo Roll Feeds offer greater performance at a value driven price. Servo Roll Feeds provide quick adjustments with no tools, closed loop accuracy and long-life dependability with precision gear drive and high performance brushless servo motor. The SMIV6 and SMIV12 Servo Roll Feeds come standard with Pneumatic Roll Lift, while the Servo Roll Feed Model SMIV 11 HS has a mechanical Roll Lift arrangement. The ServoMatic® LT, 4" Servo Roll Feed provides a low-cost alternative to the high maintenance and slow set-up of air operated and mechanically driven feeds. Servo Roll Feeds deliver fast set-ups and greater accuracy at speeds up to 600 SPM. Servo Feeds come complete with operator-oriented control panel and mechanical Pilot release. (2) Piece bracket design with a jack screw arrangement for up to 3" of passline height adjustment. Allows for the servo roll feed to be mounted directly to the press. A rugged steel weldment cabinet is furnished to a customer-specified passline height suited to the application. Passline height adjustment is provided via a handcrank for up to 8" of adjustment. The unique gib-guided, self-leveling design allows for quick and accurate passline height adjustment of up to 6" and allows the stand to hold its position once set, eliminating the need to secure the servo roll feed to the press. Our edge guides provide superior adjustable edge guidance control for varying stock widths from a single point of adjustment. Guides incorporate a slip-gear configuration to allow off-center operation where required. Can be used to provide three phase power from 440V through 480V and is able to protect the servo roll feed from equipment killing power spikes. Highly operator friendly upgrade that provides for increased job memory and servo roll feed capabilities, in addition to programmability, for automatic set-up of the entire servo roll feed system, called up by job number. Utilizing an air pump and electric timer, this option facilitates maintenance by ensuring properly metered lubrication to all critical points of the servo roll feed. All critical points of the servo roll feed are plumbed to a common manifold with a single grease fitting for ease of maintenance. Pressmate Mechanical Stagger Feeds with their patented analog mechanism provide correct "x" and "y" movement with one adjustment. Mechanical Stagger Feeds are an industry standard on eyelet machines in CT’s Naugatuck Valley. Electrically driven stagger feed models as well as mechanical stagger feed drives are now available. Pressmate Inc. manufactures one-, two-, and three-row mechanical Stagger Feeds designed to save material and cut loading time on presses. Pressmate's mechanical stagger feeds are chain driven; and by punching the strip stock 2 or 3 rows at once you save time and labor. All mechanical stagger feed models operate on a "push" principle, preventing problems often encountered when feeding thin stock. The new urethane and Teflon® stagger feed stroke plates prevent scratching and marring of material. Effective for softer metals, such as aluminum, these stagger feed guide plates handle from 1-3/16" to 10-3/16" wide strip stock of any alloy, up to .08" thick. The two-row mechanical stagger feed saves up to 8 percent in material costs and can easily be converted into a one-row mechanical stagger feed. The three-row mechanical stagger feeder saves up to11 percent in material costs.